Who’s That Dog on the Logo? People have been asking, “who is that dog on your logo”. Her name was Chelsey (a.k.a. 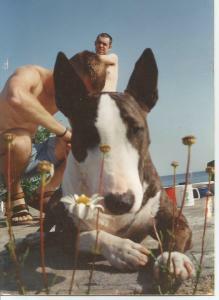 Mona-Beasta), a brindle & white English Bull Terrier who radiated joy where ever she went. Chelsey & her brother Winston had spent a very long time sheltered at the animal hospital where my huMom worked. When Chelsey’s brother found his forever home she was adopted by my huMom & became her best friend. Chelsey was well loved in her stomping grounds around the Queen St. West area of Toronto. 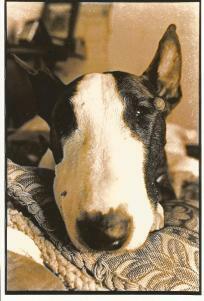 She was so popular that one year the locals held a birthday party for her in the Trinity Bellwoods dog park. So many came to celebrate, the party took over the entire park.